HDLA developed landscape improvement plans for a new 25,000 sq. ft. library located on Baugh Rd. adjacent to Bellevue Middle SchooI, a LEED Silver project. Design features include hardscape, a walking trail, meadow planting, site furnishing, planting, and coordination with the Metro Arts Commission. In 2015 Bellevue Library received the Metro Tree Advisory Committee’s 2015 George Cate Award. 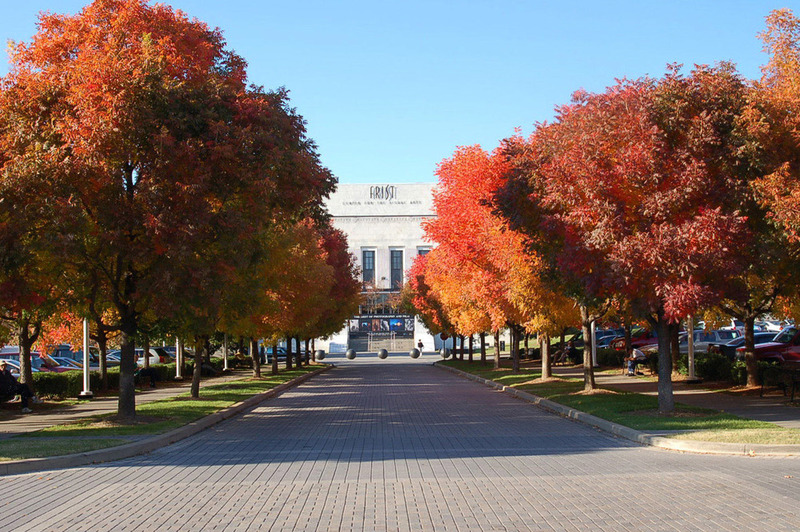 This Award is given each year during Nashville’s Arbor Day Celebration in recognition of a development project which exceeds the spirit of the Metro Tree Ordinance. HDLA was part of the design team for the Capitol Hill Renovation segment of the Bicentennial Mall. 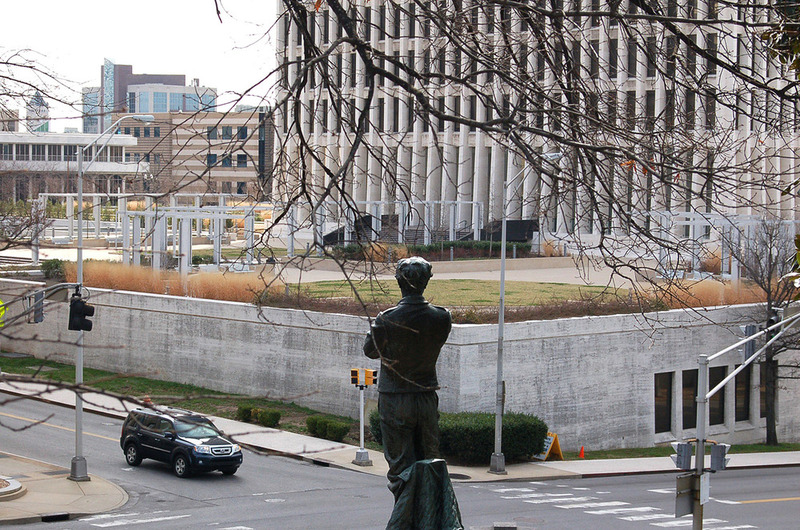 The project, which focused on the northern slope of the State Capitol, serves as the major axial overlook. Its purpose was to ensure the preservation of the northward vistas and to make the once formidable hillside a useful public square. Our responsibility in this project included: developing the overall construction documents; schematic grading plan; completion of planting and irrigation plans as well as the design and layout details of walks, steps, special pavement and other site furnishings. HDLA has been hired by the State of Tennessee to complete portions of the Master Plan that were not constructed during the initial phase of the project. The scope of work will include new walks, overlooks, pavement and wall repair, landscaping, and lighting. The job will also include the design for repair for the failing limestone retaining wall on the west side of the Capitol. The project also includes a Monument and Memorial Master Plan for the entire state campus in Downtown Nashville. A 210,000 s.f. facility witch a five-story, 200-room hotel, single-story conference center and an 1,000 + car parking garage was constructed in downtown Chattanooga on a 7.43 acre site. 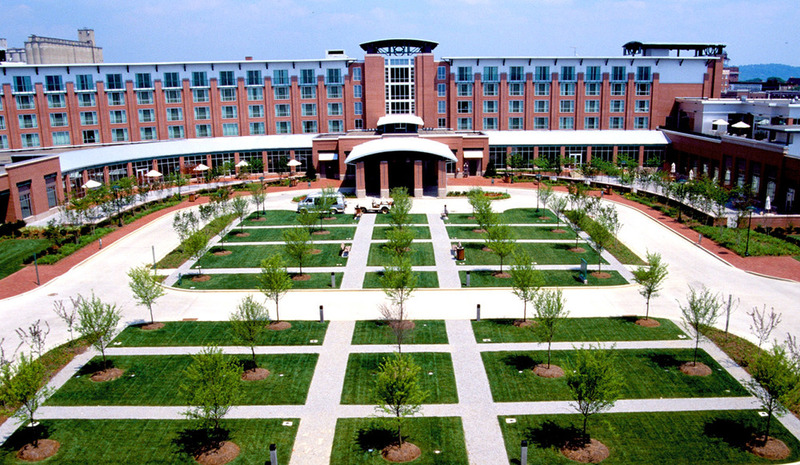 HDLA was part of the design team and our scope of work included the layout of drives, walks, plazas, specialty pavers, fountains, planters, gazebos, site furnishings, landscaping, irrigation and light fixture selection and placement. A sustainable design concept which incorporated pervious pathways, gray water irrigation, and a bioswale was developed in the final construction documents. 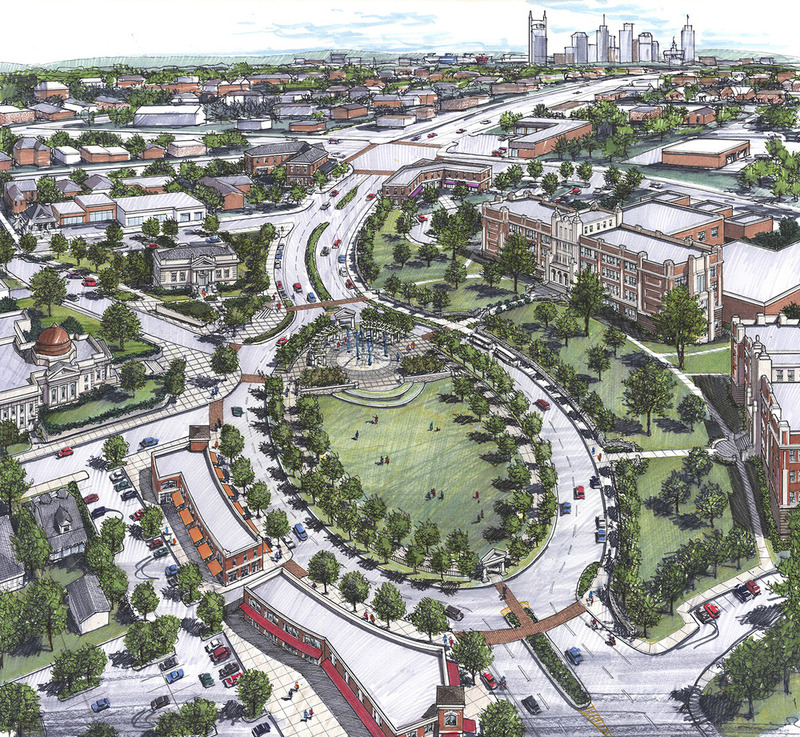 In 2005, Hodgson Douglas completed a Master Plan for the East Nashville Civic Square. This 9 month long study created a plan to establish a new town center for the East Nashville area as well as vital pedestrian links to the nearby 5 Points mixed-use development area. A series of four public meetings were held to gain input from the local residents and stakeholders. One of the meetings included a design charrette, where those attending the public meeting were broken into small groups and asked a series of questions that resulted in the creation of individual team designs for the area. Many of the ideas that came from this charrette process were incorporated into the final design. The end result was a master plan that was created and endorsed by the local community. The Master Plan includes the creation of a grand oval lawn to celebrate East Nashville with a rearranged Gallatin Rd. around an ellipse. With the pedestrian and cyclist in mind, two traffic lanes will be reduced in width as a traffic calming measure and a bike lane will be established. These traffic improvements will act as a crucial step to unifying the neighborhood as well as creating ‘green links’ to different nodes throughout the community. 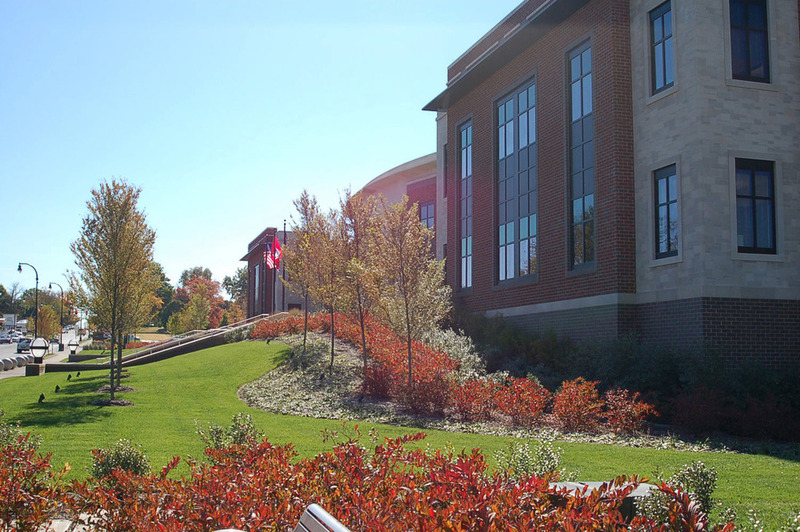 Hodgson Douglas provided site planning, design development and landscape architecture construction drawings for the City of Franklin Police Headquarters. 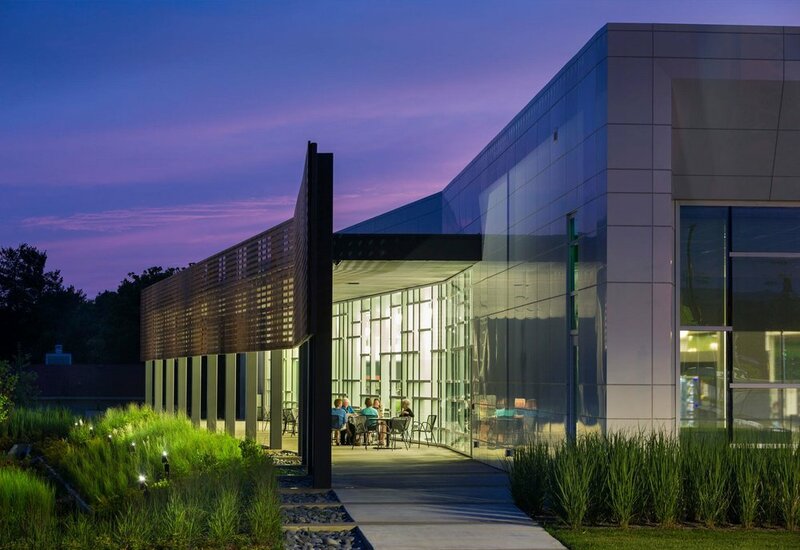 The Headquarters is a LEED Silver certified building including a 35,000 sq. ft. extensive green roof, a 40,000 gallon rainwater catchment cistern, bioswales, and an almost entirely native plant palette. The total site construction costs exceed $500,000. Master Plan and Construction Drawings for the renovations to grounds the historic courthouse located in downtown Clarksville, TN. Scope of work included the design of new plazas, walks, a “Millennium Mall” with fountain, street furniture, landscaping and lighting. The history of the courthouse is told with historic panels. Streetscape improvements were included for the four city walks around the project. Hodgson and Douglas also developed streetscape plans for the adjacent courts complex. Master streetscape plan for downtown Murfreesboro. Project included streetscape planting, new sidewalks, street lights, street furnishings, and crosswalk pavers. Public meetings were conducted by Hodgson and Douglas. Grounds around the historic courthouse were included in this project. Hodgson Douglas worked as part of a design and planning team to develop a long-range Master Plan for Music Row. Work included the development of a new traffic roundabout, streetscape design, traffic and pedestrian circulation, streetlights and landscape design. The traffic circle has become the centerpiece for a new $2M sculpture. Hodgson Douglas also completed construction drawings for over $3M worth of improvements. This work includes the renovation and reconstruction of the Owen Bradley Park. HDLA was commissioned in 2015 to design the new Tennessee State Museum. The museum boasts a large gathering lawn, a Tennessee waterways fountain, a children's outdoor sculpture court and garden, gathering courts, east end west drop off plazas, and a Tennessee physiographic walk to the north. The main axis entry walk aligns with the Capitol rotunda, while the site responds seamlessly with the Capitol Mall. Native materials, geology, ecology and hydrology express themselves as themes throughout the site. Hodgson and Douglas provided Landscape Architectural Services to create a new green roof on the renovated plaza of the Tennessee Tower in downtown Nashville for the State of Tennessee. This formerly bleak plaza was enhanced by the creation of over 30,000 S.F. of extensive and intensive green roof plantings. This has resulted in one of the largest green roofs in the State of Tennessee. A light weight soil mix was used. The green roof will provide energy savings for the conditioned space beneath, reduce the heat island effect and provide an important pedestrian friendly outdoor space for downtown. The extensive plantings decrease the storm damage run-off and decrease air pollution. The landscape planting concept was created to complement the strong simple International style of the architecture. The construction cost of the entire project was approximately $12M.